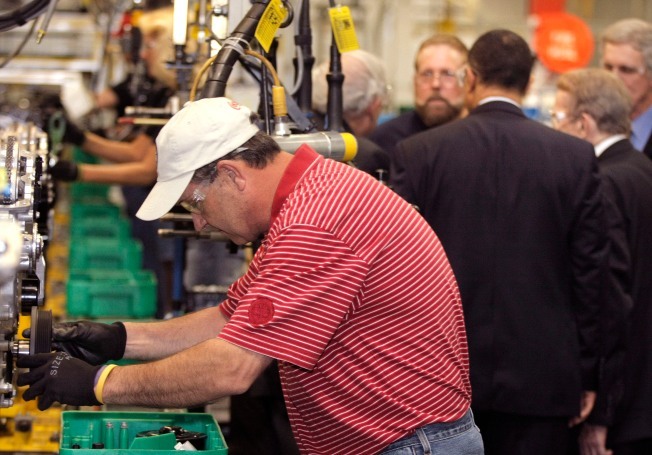 The U.S. manufacturing sector is roaring back after the worst recession in generations. So why aren’t factory jobs coming back as quickly? One big reason: Business executives like Drew Greenblatt, owner of Baltimore-based Marlin Steel Wire Products, have figured out how to make more widgets with the same number of workers. To do so, he's had to upgrade the skills — and wages — of his employees. But his profits are bigger than ever. Last July, the company, which makes wire baskets, installed $700,000 worth of robots, continuing a steady process of automation Greenblatt began when he bought the company in 1998. For Greenblatt, the math goes like this: Last year, his revenues and profits were up 12 percent — his best year since buying the company in 1998. That year, Merlin Steel did $800,000 in sales with 18 workers. Today the company has 25 employees and does $3.9 million in sales, exporting to 33 countries. Automation raises productivity not just by making products faster; it also makes them better, said Greenblatt. Productivity gains like those continue to show up throughout the manufacturing sector. The level of output per hour worked rose by 2.6 percent in the last three months of 2010, the Labor Department reported Thursday. A separate report by the Commerce Department showed that U.S. factory orders rose in December, pushed higher demand from businesses for machinery and communications equipment. Orders have risen in five of the past six months. The rise in orders has prompted manufacturers to boost hiring. On Friday, the government reported that the sector added 49,000 new jobs in January - even as bad weather dampened employment gains for other industries. Productivity is a pretty simple concept: It’s a measure of how much stuff a worker makes in a given number of hours. But increases in U.S. productivity are the result of complex forces that have been reshaping the manufacturing workforce for decades and are expected to continue. Recently, productivity got a boost from the fallout of a harsh recession that put weaker, less-productive companies out of business or forced them to sell out to stronger, more productive competitors. Widespread job cuts during the recession also transformed the workforce on individual factory floors, said Greenblatt. Productivity has also risen as American manufacturers have moved to specialize in more valuable products, sending manufacturing of cheaper goods overseas where wages are lower. As the value of American-made products has risen, so too has the average level of output per worker when measured in dollar terms. Rising global demand for high-end, capital intensive goods is boosting exports for American manufacturers like Oshkosh Corp., a Wisconsin-based maker of high-end, heavy-duty specialty trucks. The company recently began hiring to keep up with increased demand from overseas customers and to fill a new truck order from the Defense Department. The order will also mean about $1 billion in business for the company's suppliers, said Szews. Manufacturing high-end products like fire trucks or military vehicles requires piles of capital to build the cutting edge plants and buy the sophisticated equipment needed to make them. Though American manufacturers have been slow to re-hire workers, they’ve been making big bets on capital investment coming out of the recession, especially in high tech products. At some point, productivity gains could become harder and harder to achieve and begin tapering off. But economists like Runiewicz say American manufacturers are a long way from reaching that point. But while automation is advancing, millions of low-skilled factory workers are being left behind, said Runiewicz. Higher completion rates for college diplomas and a boom in admissions to technical schools and community colleges are helping to upgrade worker skills. Some of the burden is also falling on employers like Greenblatt. Improved access to training, along with booming exports, will help. But most economists expect the jobless rate to remain stubbornly high – especially among lower-skilled workers. Without a more robust economic expansion, it will be years before those factory workers sidelined by the recession will begin collecting a paycheck again, according to Dean Baker, co-director of the Center for Economic and Policy Research. “Even in the best case scenario you could make, I can’t imagine you could look to make up the up the gap with increased exports in seven, eight or nine years,” he said. Many of those workers may never get back to work, said Baker.